Welcome to the Scentsy Layers Laundry Care Sweepstakes! Love your laundry this summer with your pick of three bright and breezy scents — Serene Green, Jet Set Go, or A Wink & A Smile — available for the first time ever in Layers Laundry Care! … plus a reusable gift bag! This special offer is available beginning June 1, 2014 from Midwest Scentsy, while supplies last. 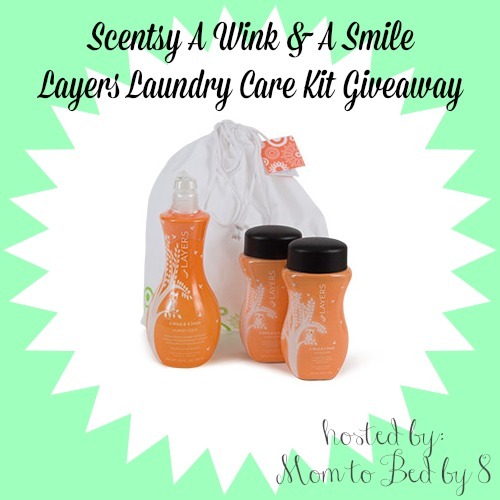 One winner will receive a Scentsy A Wink & A Smile Layers Laundry Care Collection. Giveaway ends July 21th at 11:59pm, open to US and Canadian residents, ages 18+. Only one entrant per household, per address. Winner is subject to eligibility verification.